Business Address: 29 Tran Quang Khai St. Discover all that Hue has to offer with Hue Queen 1 Hotel as a base. 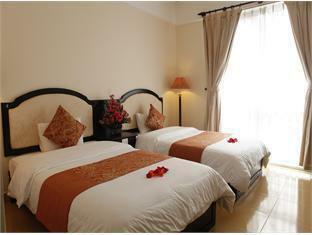 The Hue Queen 1 Hotel provides all the amenities that today's travelers desire in all of its 58 rooms. Each guestroom features amenities such as non smoking rooms, air conditioning, bathrobes, inhouse movies, desk. The basic amenities provided at this Hue accommodation comprise elevator, bar/pub, laundry service/dry cleaning, meeting facilities, restaurant, room service, disabled facilities, hotel/airport transfer. For a more enjoyable stay, guests can take advantage of a variety of recreational facilities, including massage, sauna, outdoor pool. This hotel is characterized by a combination of modern comfort and traditional element of Hue, making it a distinct accommodation. To book a room at the Hue Queen 1 Hotel, please select your dates of travel and complete fill out our secure online reservation form.